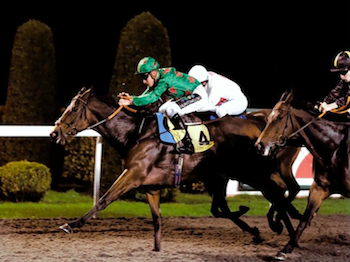 Delighted that Lightning Charlie won the ’32Red.com Handicap’ over six furlongs at Kempton last night. Ridden by Jason Watson he settled in behind the leaders before leading from over one furlong out and kept on well in the final furlong to win by 1/2 length. Congratulations to all connections involved in the Lightning Charlie Partnership. He has had thirteen starts this year for the Lightning Charlie Partnership, winning twice and placed on eight occasions. He will continue to contest six furlong handicaps and excels on the all weather.